OG Darth Vader (sometimes referred to as Darth Vader OG) is a heavy Indica dominant strain. 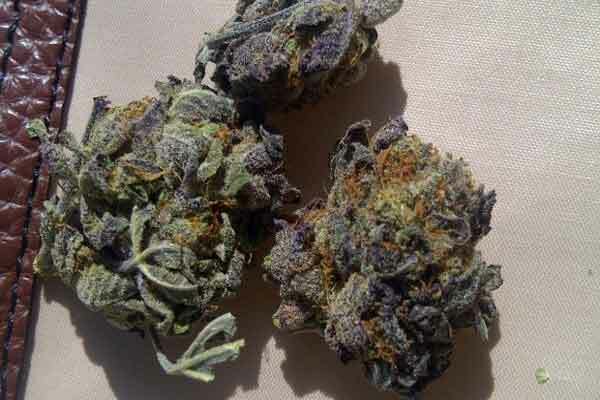 OG Darth Vader is a heavy green color with wonderful purple hues and is an amazing plant to behold. It is a popular and much-loved strain. OG Darth Vader can be a little sticky and a good grinder is needed to grind the dense buds effectively. The Indica dominant effects are profound in this strain, and it is most commonly described as a relaxing, happy and peaceful strain of marijuana. OG Darth Vader is a mix between Afghani and Kush, and its dense and sticky buds are a great visual appeal. Just a few drags of this strain are enough to induce sleep and happiness. The high is quick to take effect and the body stone is far more potent than the mild cerebral high. The exact Indica to Sativa ratio is unknown, though it is expected to be around 70-80% Indica dominant. The aroma of this powerful strain is sweet with a sour tinge of grape and compliments the sweet earthy flavor very well. The strain offers a delicious, rich and smooth smoke and its buzz will last a solid 2 – 3 hours. Ideal for a lazy night, this strain will relax and soothe you, offering a floating sensation and helping you to drift off into a restful sleep. It is a hugely popular strain that has been around for nearly 30 years. THC levels of OG Darth Vader are high, between 18-22%. Why do Patients Use OG Darth Vader? OG Darth Vader is a medical powerhouse. It is ideal for the treatment of insomnia, pain, and stress. Due to its potency, it will quickly envelop users in a shroud of sleep and relaxation. It is the ideal strain for evening use after work. It is not an ideal strain for creativity, problem-solving, socializing or when out and about. The couch lock effects are too strong and it may induce sleep and lethargy. Not for novice users due to its potency. OG Darth Vader has a rating of 9.2 on the stoned meter. THC levels of OG Darth Vader are between 18-22%. Breeder Of Darth Vader OG unknown. Long flowering time between 9-11 weeks. Best grown indoors in Sea of Green setup. OG Darth Vader grows between 3-5 feet. OG Darth Vader is a high yielding plant. Moderate growing skills required to grow OG Darth Vader. Plants need support during the flowering period. Susceptible to mold.